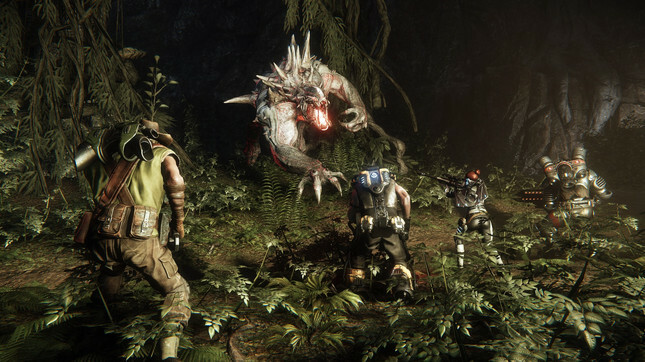 Developer Turtle Rock is ceasing development and support for its online monster-hunting game Evolve, effective today. The asymmetrical multiplayer shooter's servers will remain online, according to publisher and rights-holder 2K Games, but per a blog post from Turtle Rock co-founder Chris Ashton, the studio has been released from its contract on the game. "This is the life of AAA game developers who aren't self-funded and don't own their own IP," wrote Ashton. "We don't get to make the call." "We all know that going in but we still sign the dotted line because we love what we do. We are happy to have gotten the opportunity to do something risky, something new and innovative." Initially a full-priced retail game, Evolve went free-to-play earlier this year, and while the move sparked a significant bump in player counts, it clearly wasn't enough to keep Turtle Rock - which hoped to bring the free version to consoles - in work. The studio went through a similar process some years ago, when it developed Left 4 Dead before signing it over to Valve. Turtle Rock itself will continue to develop future projects, and has "lots of stuff in the works," according to the blog post. Ashton and the Evolve team will host one final livestream tomorrow at 8am New Zealand time, via its Twitch channel.